At Smiths Medical, we care deeply about the safety of our employees and the environment. We are committed to the highest standards of HSE management in meeting our legal and moral obligations both locally, nationally and internationally and manage this aspect of our business with the same diligence that we give to other key objectives. We strongly believe in a process of continuous improvement, the implementation of best practices and the use of internationally recognised HSE management systems. All manufacting, warehouse and service sites with more than 50 employees are required to be certified to ISO14001 and OHSAS18001 management systems. In meeting this requirement Smiths Medical has a single ‘Group’ certificate with 19 of our 20 major facilities certified. Our new European manufacturing facility is working to be included in the Group certificate. 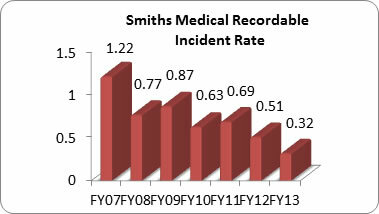 Smiths Medical is committed to protecting, as far as reasonably practicable, the health and safety of its employees. Our employees recognise this commitment. Workplace safety was the highest scoring dimension in our employee engagement surveys, exceeding the worldwide benchmark for the manufacturing industry. Since 2004, we have achieved a steady reduction in our Recordable Incident Rate (RIR), and in FY2013 we achieved an RIR of 0.32, beating the target for the year of 0.48. Our strategy and health and safety program of activities to reduce incidents have focused on leadership and employee safety awareness and involvement. We continue to implement and build on these activities and are monitoring them through our Safety Leading Indicator Activities Programme. Sites are required to complete a minimum number of each of the following activities as part of our focus on health and safety. 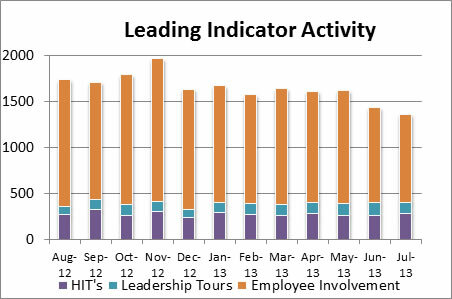 Sites report their scores monthly and are required to achieve annual targets. In FY2013 we revised our targets to increase our focus on safety leading indicator activities designed to further reduce the risk of incidents. We are committed to reducing our environmental footprint through continual improvements in energy efficiency, greenhouse gas emissions, water consumption and waste generation. This includes using performance-based environmental management systems to drive improvement throughout the business. Our sites monitor their energy and water usage, waste generation and greenhouse gas emissions, identify opportunities for reduction and implement improvement plans. We share action plans, lessons learned and best practices across the sites and with Smiths Group. Our environmental performance through FY2013 continued to be very favourable compared to our baseline year of FY2010. We achieved significant reductions in all metrics and exceeded our FY2015 goals. In FY2013 we developed our next set of strategic objectives and goals. Our new environmental targets require 15% reductions in energy usage, greenhouse gas emissions and waste generation and a 10% reduction in water usage by the end of FY2018, all normalised to revenue against a baseline year of FY2013.